As we’ve engaged with our customers this year, we’ve heard a lot of questions about pricing strategies. But asking what to charge is like the old adage about getting the cart before the horse. Or, in 21st century parlance, it’s like planning a web-based business when you don’t have internet access. How do you manage profit if you don’t know your operating costs? We have general estimates from printer and ink manufacturers, but when it comes down to the nitty gritty, you need specifics. And speaking of 21st-century business, in the age of analytics, most successful companies manage their costs based on specific data, not generalizations. If you own a PrismJET VJ24, 24X,or VJ54 and you want to know exactly what your print costs are, we have the answer. LXI RIP 12 Cost Estimation tools get rid of the guesswork. Here’s how to drill down and get specific cost info on every job you print. Before we show you how, perhaps we should talk about why. If you have a ballpark figure, why bother getting the specific job costs for signs and banners? Have you ever given a price concession to a pushy customer only to find out later that you actually lost money on that job? Have you ever wondered how much more you should charge picky customers for higher resolution prints? With LXI RIP 12 Cost Estimation tools, you’ll know your actual ink and media costs for any given print job. Armed with this knowledge, you can deal more wisely with customers who insist on haggling for a better price. You’ll know when to hold the line and when to walk away. You’ll also know how using different profiles affects ink costs, so you can balance cost vs. quality. Specific cost data can also inform your decisions about compensating employees and sales personnel or simply give your employees the tools they need to make smart decisions. So there are lots of good reasons to use it. Now, let’s see how it works. One of the best features of LXI RIP 12’s cost estimation tool is its simplicity. There’s no need to calculate your ink cost per liter when you don’t buy liter bottles of ink. And most of the data inputs only need to be done once. Once the feature is configured for your ink and media, job-specific estimates can be produced with a few mouse clicks. Detail-oriented people and visual learners will appreciate this step-by-step tutorial. For ‘cut to the chase’ types, here’s the ‘Reader’s Digest’ version. 1: Prepare your print job and get it ready to send. If you’re going to print several copies, get that all set before proceeding. 2: Click on the job in Production Manager and drag it to the RIP queue window. 3: After it’s done processing, click the Estimate button in the top nav bar. 4: Configure the Ink Cost estimator by entering the size and price of your ink cartridges, then click Estimate. The RIP shows you the ink consumption and cost by color, with a total for all channels. You can export this data to a spreadsheet for future reference. 5: To get media costs, right click on the job in the queue and select Job Estimation. In the Job Estimation window, click the Estimator Edit tab. 6: Add names and square-foot costs for the print media you use. Do the same for any finishing materials like overlaminate film, hem tape, mounting, etc. 7: Then just select the media and finishing tools you’ll need for the job. The Job Estimation tool calculates the totals based on your job properties. You can even add sales tax. Now you can open the spreadsheet with the exported ink cost data and add your media and finishing costs for a total job-specific cost projection. We see from our example that a batch of 12 wall decals printed on premium quality WallTex adhesive fabric costs only $8.65 including ink, media, overlaminate film, and sales tax. If you charge the industry standard of $8.00/square foot, you’ll have a gross profit of $47.03. Even if you have to adjust for market prices and drop to $6.00/sq ft, there’s plenty of profit. As Yosemite Sam might have said, Thar’s gold in them thar stickers! The point is, basing your price on material cost is a common mistake. Set your price based on what the product is worth in your market area or what it’s worth to your customers. The other important factor is profiling. Using the correct ICC profile for your media ensures that you get good print quality and correct color without using more ink than needed. Over-inking extends drying and curing time, which reduces productivity. But it also increases print cost because it uses more ink than needed. In other words, when you use the wrong ICC profile, you risk wasting money. We can see this effect in an example from our PrismJET VJ54 print sample files. These are available by request on the VJ54 page on printers.signwarehouse.com. If we print the popular ‘Children in winter’ image on PrismJET 203 glossy vinyl with the correct PrismJET 203 Graphics2 ICC profile, LXI RIP 12’s cost calculator gives us an actual ink cost of only 4 cents each. So a dozen would use just 48 cents worth of EnduraINK PRO ink. If, however, we switch to an Arlon profile, the same image costs 6 cents each. Our ink cost has jumped 50% just by using the wrong profile. If you do this every day means you’re throwing money away (nothing against Arlon. it’s just not the right profile for this media). There is one important factor that’s not covered here: time. Time is also a finite resource that must be accounted for and a key factor in measuring productivity. It will be very helpful to know how long it takes to print 10 banners or laminate a printed vehicle wrap. How long did it take to design the graphics? What kind of design fees should you charge? That data isn’t included in the Estimate module, but there are other options. SignTracker might be the best way to fill in the gap. SignTracker has a full detailed quoting tool that allows for detailed costing, controlled mark ups for all labor and materials, as well as a tool that accounts for waste. There’s also a tool for formula pricing that allows you to set volume discounts for repeat customers. Speaking of pricing, one of the best things about the Cost Estimation module is that it’s included in your purchase of LXI RIP 12 software, which is included with your purchase of a PrismJET VJ24, VJ24X, VJ54, VJ64, or DS42 printer. No upgrades or downloads required. 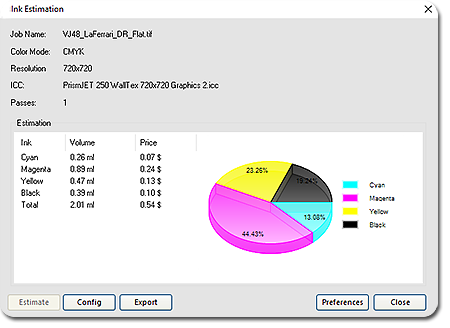 A few extra mouse clicks gives you important insight into price and profit strategies for your PrismJET printer. If you have questions or suggestions about how you can apply this in your sign business, feel free to drop them in the comments below.